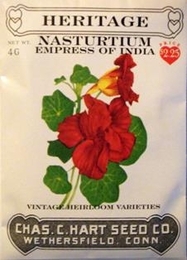 First introduced to Europe in the sixteenth century from Peru, this is the classic Victorian nasturtium. Grown originally for its medicinal value, it quickly became the subject for gardeners, chefs and painters. Unusual scarlet flowers with long spurs appear atop a mounding plant. Unlike many nasturtiums, these have a sweet scent. The blue-green leaves and the flowers are often used as a peppery tasting addition to salads. Pickled seeds are a caper substitute. Plant seeds directly outdoors in full sun 1 week after last spring frost. Cover seeds with 1/4 inch of fine soil. Thin to 12 inches apart. Lovely in containers. For best flowers do not fertilize.